They laughed; they laughed some more; they left inspired. 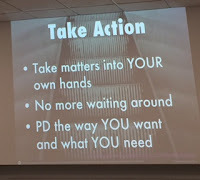 Kevin Honeycutt left conference attendees at the Parke Vermillion Summer of eLearning Conference feeling challenged. Honeycutt is a husband, a father, an educator, and a role model for students and teachers across the world. His message is chock-full of stories and great one-liners that make you stop in your tracks and just think. He speaks truth about being responsible digital users and models for our students as demonstrated by this tweet: "Kids are largely raising themselves on the digital playground and there is no one on recess duty when they fall off the slide" (@mollyyowell). Honeycutt strongly believes that as teachers we should give our students the space in our classrooms to "rehearse" how to be responsible digital citizens. Furthermore, Honeycutt advocates for student choice in the classroom. By giving your students choice in the classroom you give them ownership, teach them responsibility, and make them feel like rockstars. Along with this, we must encourage in any way that we can our students to WANT to learn. 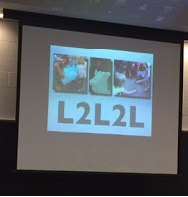 Honeycutt shared his L2L2L acronym which stands for Learn 2 Love 2 Learn. As teachers we have the ability to spark our students love of learning, and it's not just our job to teach content, but to teach our students HOW to learn. And by students I mean ALL students, even that kid wearing all black sitting in the corner. One great line that Honeycutt shared was that as teachers we should: "Flip a kid like you flip a house." Invest in your students and be prescriptive. Each day find an individual student. Find out what they need and support them. "Give them the best day of their life," said Honeycutt. Following Honeycutt's keynote, some attendees had the opportunity to learn more about Coding inthe Curriculum with Tara Linney. Tara is a Google Certified Teacher who shared how coding can support the already defined classroom curriculum. Coding supports many Indiana Standards by requiring them to look at patterns and sequence. It can even sharpen student's writing and listening and speaking skills in the ELA classroom. Tara shared some of her favorite resources, one being Code.org and the other free resource being Scratch. You can find more coding tools HERE. Tara also encouraged teachers to develop 6 habits for teaching coding, one being to allow the students to become the expert. 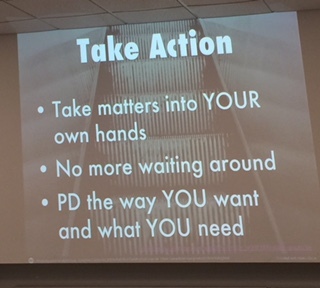 Next Tiffany Todd shared with educators 5 Steps to Make PD Teacher Driven. Tiffany strongly believes in teacher-owned PD as opposed to the traditional "SMORE FEST" PD. In her district she uses badging to encourage her teachers to learn new tools. Her PD model allows the teacher to pick their interest, learn it on their own, create/model what they learned, and then share their experiences with Tiffany. 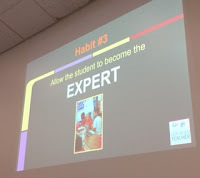 She awards them PGP points and badges for their professional learning time and feels this model has worked well with teachers of all ages and content areas. You can see her badges for yourself HERE. Brad Fischer, a Director of eLearning with Five-Star, hosted this excellent learning opportunity for school leaders who are investigating or are already leading in a school where students and teachers have devices to access content. Commonly this is called a 1:1 environment but we talked about how these conversations are not about tools rather about preparing our students to collaborate, communicate, create, and think critically. Brad shared the 14 essential conditions that ISTE recognizes as critical to consider when preparing to implement a 1:1 teaching and learning environment. Brad also shared another condition that Five-Star really considers important for school leaders: a sense of urgency. We really focused on building a shared vision and then sharing that vision based on a sense of urgency to give our students and teachers the very best we have to offer. Brad is a great resource to school corporations and individual educators. There are four more opportunities to attend an Admin Academy at a Summer of eLearning Conference near you. For more information visit HERE.